As a child I liked Thanksgiving hymns even better than Christmas carols – perhaps because I’ve always been a bit of a contrarian. My daughter, Brynn, is the same way. Case in point: She probably would have disliked the Twilight books even if her friends hadn’t crooned over them. But the abject loathing she expressed whenever they were mentioned, coupled with facial contortions and intermittent retching noises, were, by her own admission “because everybody else likes them so much.” Another case in point: The animals that elicit her protective instinct aren’t those with soft fur and big eyes but those with cold skin and big teeth. You catch the family pattern. Some things change, and some things, like a tendency to swim upstream, don’t. My understanding of our Thanksgiving holiday is one of the former; my stubborn refusal to abandon my traditions despite their religious history, is one of the latter. It’s been a long time now since those cherished Thanksgiving hymns expressed my feelings about the warmth and bounty that carry me through the winter. “Come ye thankful people, come. Raise the song of harvest home. All is safely gathered in ere the winter storms begin. . . .” Well, ok, that one still makes me feel nostalgic and snug—at least until I come to the line “God our maker doth provide, for our needs to be supplied,” at which point I start thinking about a mom I met in Guatemala and a club-footed child beggar in Delhi–and my old belief that God had provided me rather than them with a stuffed turkey is somewhat embarrassing. When I first learned that the earliest Thanksgiving proclamations celebrated God’s generous assistance not with the natives but against them, I felt betrayed–not surprised, mind you; the fairy-tale version of American history had already fallen apart for me–but betrayed none the less. Disgusted. It tainted the holiday. But now I see things differently. Between the mid 19th Century and early 20th Century, proclamations of thanks to God as our leader in battle were replaced by a holiday that now draws as its mythic archetype a harvest feast shared by pilgrims and Wampanoags in 1621. It is ok for a celebration of brutality to evolve into a celebration of bounty. It is ok for a celebration of division – of us-vs.-them – to evolve into a celebration of unity. In fact, it is more than ok. We can grow as a society only if our rituals and traditions are allowed to grow with us, because ritual and tradition are too deeply rooted simply to be abandoned. If they don’t evolve, they become anchors tethering us to the values of the past. That doesn’t mean we should deny our history, including what Thanksgiving once meant. Recognizing what darkness we are capable of empowers us to rise above it. Where we are today is even more worth celebrating when we honestly acknowledge where we have come from. Part of my own history was a self-centered belief in an interventionist God who provides turkeys for American kids while others starve. Thanksgiving was a religious holiday for me just as it was for generations of American Christians, both the ones who praised God for brutality and the ones who praised God for bounty. Some would say that God is at the heart of Thanksgiving, irrevocably, and those of us who are nonbelievers need to accept that and decide whether we are in or out. But God is no more at the heart of Thanksgiving than brutality is – meaning both were, and both can be, but neither must be. This is where my contrarian nature kicks in. I decline (politely but stubbornly) to accept God as a part of Thanksgiving, to bow during prayers or mumble through those once resonant hymns. I decline (politely but firmly) to accept the myths of my childhood: the myth of a promised land and a group of chosen people who did harm only in the service of self defense, the myth of a interventionist deity who feeds some of his children. But just as firmly I refuse to abandon the practice of thanks-giving and the holiday of Thanksgiving. For me, ever and always, November will be a time of celebrating the love and beauty and bounty that life has bestowed. This year, and for years to come, it will be a time of cooking and eating and participating in a community of shared, humble gratitude. It will be a time of evoking the deep wonder that we, small peculiar manifestations of the universe made conscious, have been so blessed. Valerie Tarico is a psychologist and writer in Seattle, Washington. 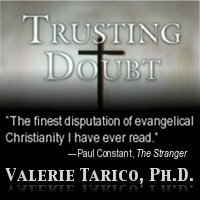 She is the author of Trusting Doubt: A Former Evangelical Looks at Old Beliefs in a New Light, (Revised ed of The Dark Side) and the founder of www.WisdomCommons.org. Her articles can be found at awaypoint.wordpress.com. Gallery | This entry was posted in Uncategorized and tagged atheism, holidays, humanism, recovery from religion, Thanksgiving. Bookmark the permalink. Nice combination of personal and informative. Just read this. Two hours after making my own, “I’ll have the turkey, but no Christianity please,” blog post (No Thanks for the Mundane Morality of Christians). As with Christmas, I’m beginning to think that rather than acquiescing to the religious claim that the holiday is theirs, it’s time for pagans and heretics to say, no, the holiday is all of ours. Exactly. Harvest festivals, solstice festivals, rites of spring–if they can transition from pagan to Christian they can also transition from Christian to universal. Thank you for this thought-provoking and inspirational piece, Dr. Tarico. Have a terrific day!